You are currently browsing the archives for the CAIR category. Ellison: Ideology first or people first? This article might offer the most revealing insight into why Keith Ellison left his DC job to pursue the AG’s job. Despite his talk about representing the people, Ellison is mostly interested in harassing President Trump with lawsuits. It isn’t likely that Ellison would be interested in strengthening law enforcement. In fact, it’s easier to picture Ellison becoming Minnesota’s version of Eric Holder. It isn’t a stretch to think that Ellison would launch tons of investigations into Minnesota’s police departments. 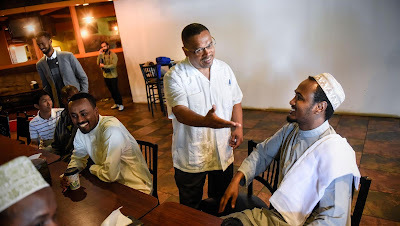 Most likely, Twin Cities police departments would have the most to fear from Ellison. Mostly, he’s defended cop-killers like Assata Shakur. 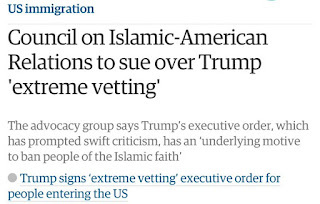 He’s better off as a lawyer for CAIR than anything else. That explanation simply isn’t credible. At one point, Rep. Ellison talks about talking with people in rural Minnesota. That’s a bunch of BS. The only time he’s seen outstate Minnesota is from his airplane heading to or from Washington, DC. His gibberish about fighting for people who “didn’t have anybody on their side” is utter spin. Ellison’s legal career was spent defending cop-killers like Assata Shakur. Actually, Scott Johnson’s article leaves no doubt that Ellison is a liar. Johnson’s timeline leaves little time for defending people’s civil right in court actions. This past weekend, there was an event where it was discussed whether there was a possibility of a repeat of the internment of Japanese-Americans during World War II. The question this time was whether this might happen to Somali refugees. After reading this article, it isn’t difficult to picture these panelists as propagandists. 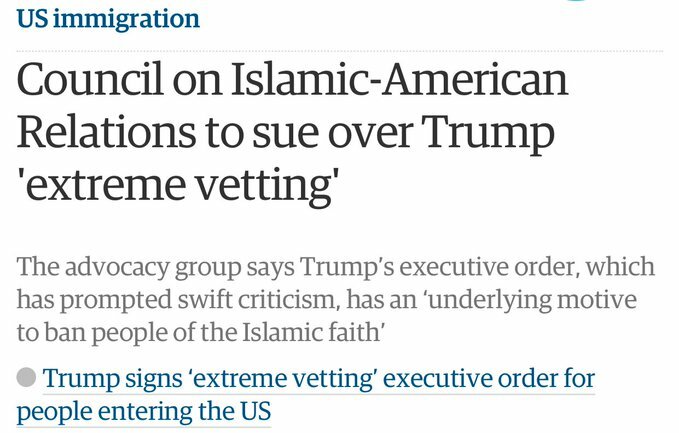 That sentence is always included in any article that mentions CAIR. Actually, CAIR is more accurately described as an unindicted co-conspirator in the Holy Lands Foundation trial. A federal jury ruled that the Holy Land Foundation “was convicted on 10 counts of conspiracy to provide, and the provision of, material support to a designated foreign terrorist organization; 11 counts of conspiracy to provide, and the provision of, funds, goods and services to a Specially Designated Terrorist; and 10 counts of conspiracy to commit, and the commission of, money laundering.” But I digress. Organizers say the panel is especially timely given a recent attempt by a St. Cloud City Council member to pass a moratorium on refugee resettlement in St. Cloud. The measure failed with a vote of six to one, with council member Jeff Johnson as the only yes vote. The council then reaffirmed a resolution they passed a few weeks before saying St. Cloud is a welcoming community. Talk about spin/propaganda. There’s nothing in Councilman Johnson’s resolution that would’ve violated anyone’s civil liberties. 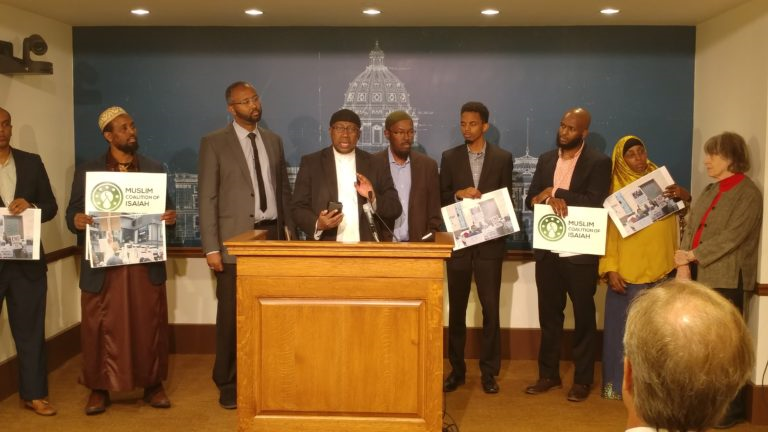 The thought that CAIR-MN would attempt to connect the Japanese internment of World War II with Councilman Johnson’s resolution says everything about CAIR’s motivations. CAIR’s dishonesty is showing. The definition of internment is “the state of being interned; confinement.” The definition of moratorium is “a suspension of activity.” This is classic CAIR fearmongering. There isn’t a chance of Somali refugees getting put into confinement. I watched the Oct. 23 City Council meeting. They didn’t have a lengthy discussion on Councilman Jeff Goerger’s resolution. Jeff Johnson was the only person who spoke in opposition to Councilman Goerger’s resolution. During his presentation, Councilman Johnson quoted from the Refugee Act of 1980. There wasn’t any mention of religion during Councilman Johnson’s presentation. It focused on the relationship between the federal government, the local government and the placing agency. 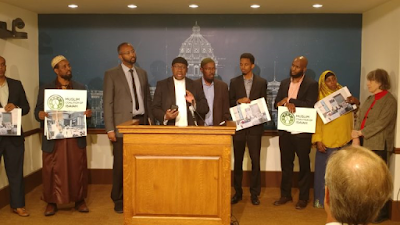 To hear the propagandists from CAIR explain what happened that night, you’d think that hordes of angry white people had told reporters that they wanted to drive Somali refugees from St. Cloud. That didn’t happen. Simply put, the CAIR propagandists are totally dishonest. Their propaganda shouldn’t be tolerated. With all due respect, I don’t feel inclusive when terrorists attack law-abiding citizens while they’re shopping on a Saturday night. Forget about condemnations of violence. What’s expected is assimilation into the American culture. It’s been expected of every immigrant and refugee in US history. The US is multi-ethnic. It isn’t multicultural. Period. The system that this nation’s Founding Fathers put into place is pretty incredible. That’s the standard. We don’t change. We expect immigrants and refugees to adapt. That’s how it’s done since our nation’s inception. What a bunch of crap. The citizens of St. Cloud simply want neighbors that obey the rule of law. 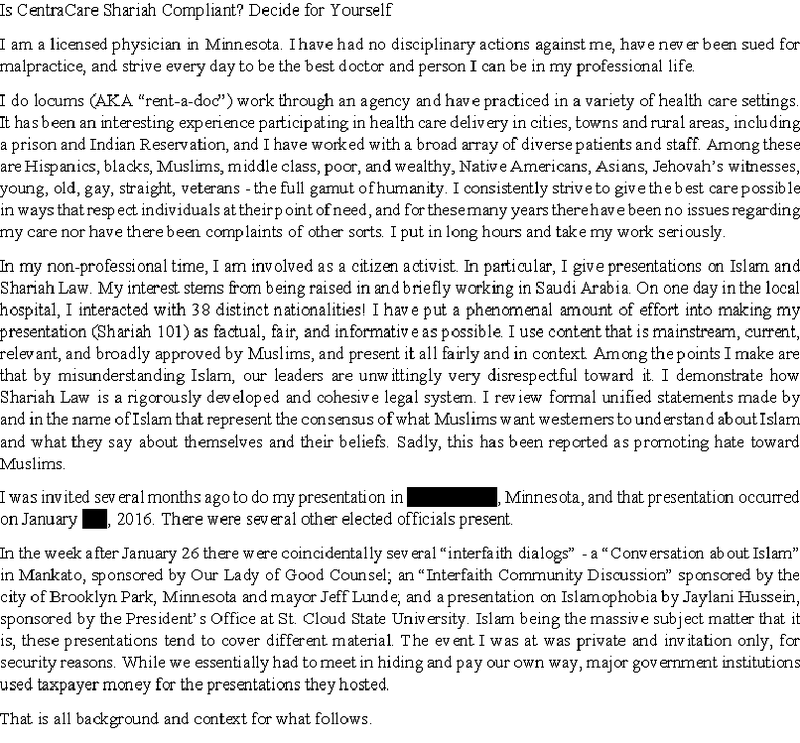 Where Islamic religious teachings depart from US law, the citizens of St. Cloud expect everyone to comply with the laws of this city and state. It isn’t that complicated. If that isn’t to someone’s liking, there are other places to live. This isn’t a test for the entire community. The entire community didn’t commit a terrorist attack. 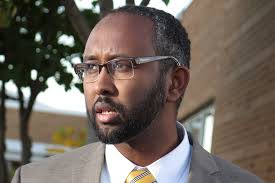 The question that must be answered is whether the Somali community will conform to St. Cloud’s and Minnesota’s laws. If they do, they’re welcome. If they won’t, they aren’t welcome. It’ll be interesting to see how Minnesotans react to this terrorist attack. If they’re more worried about terrorism than Minnesota Nice, Hillary might spend the last 50 days getting nervous. A little over a month ago, I held my annual fundraising week. To say that I appreciate those people who contributed is understatement. Due to some unusual circumstances, I’m holding a supplemental fundraising drive. Last night, I wrote my first post on a series about ‘creeping Shariah’. I’ve written about many important issues in the 11 years I’ve operated LFR. None of those issues is as big as this issue. In fact, none are even close in importance. I’m a strong believer in the old Biblical admonition that “a worker is worthy of his wages.” With most issues, I don’t press my case on this. Most issues, though, are transient. The issue of creeping Shariah isn’t transient. It’s the opposite. It’s existential. The harm that Shariah law can do to western civilization is immense, though CAIR will attempt to minimize Shariah’s impact. I will attempt, through this series, to highlight the potential impact of Shariah. If you want to contribute to getting this information to the public with a check, leave a comment to this post and I will contact you on how we can make this happen. Otherwise, feel free to contribute by clicking on the Donate button in the upper right hand corner of the page. As always, thanks for your contributions. Know that they’re definitely appreciated. When I first read this article by Alpha News, it caught my attention for all the wrong reasons. 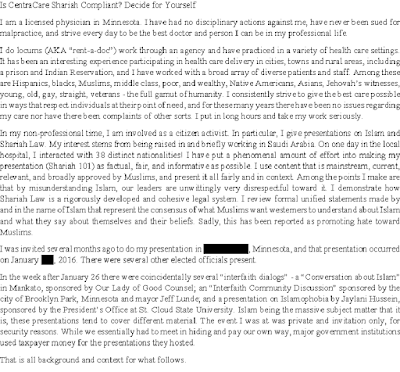 Before we get into the specifics of Alpha News’ article, it’s important to know that the person who has been criticized by various Muslim organizations, including the Central Minnesota chapter of CAIR MN, asked Alpha News to not use his real name. Alpha News agreed, causing them to refer to the person getting criticized as Kevin Johnson. Additionally, it’s important to know that Johnson is a licensed physician. Johnson put together a presentation titled Shari’ah 101, which he presented in January of 2016. 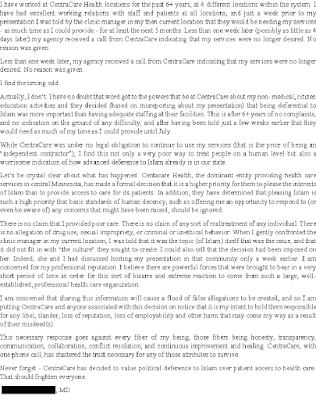 Shortly after giving his presentation, Johnson’s work at CentraCare was terminated. One of the things from Johnson’s presentation was Article 24 of the Cairo Declaration on Human Rights in Islam. Follow this link to read the entire document. It’s part of the University of Minnesota’s Human Rights Library. 1. Everyone shall have the right to advocate what is right, and propagate what is good, and warn against what is wrong and evil according to the norms of Islamic Shari’ah. In other words, all rights are tied to whether people speak ill of the Prophet or whether they speak well of the Prophet. The key principle to take from one of Islam’s foundational documents on human rights is that human rights aren’t extended to people who don’t accept the Prophet’s teachings. The key point to take from this ‘human rights document’ is that it doesn’t square with the Constitution’s Bill of Rights. Specifically, it doesn’t square with the First Amendment. Finally, the key point to take away from Kevin Johnson’s story is that he was terminated by CentraCare less than a week after he’d given this presentation. 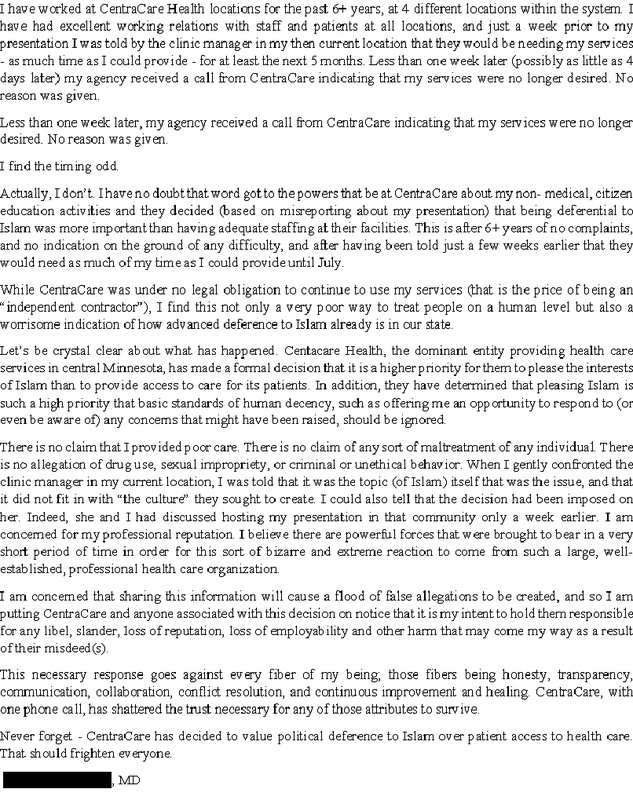 CentraCare has decided to value political deference to Islam over patient access to health care. That should frighten everyone. That’s political cowardice on CentraCare’s part.